My WebApplication is an ASP.NET Core Web Application (version 1.1) which uses EntityFramework Core 1.1. I use a commonly used Northwind SQL Server sample database which I created using the following tutorial. I have scaffold the Northwind database and created the controllers for the Suppliers and Products. Read this tutorial to learn how. 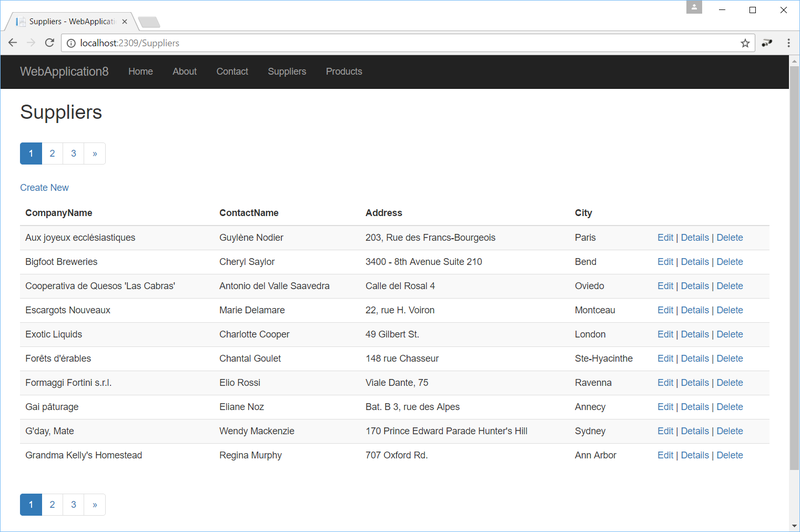 I have added some extra navigation hyperlinks in the _Layout.cshtml file for the SuppliersController and ProductsController (Action Index). The Index.cshtml file from the Views/Suppliers folder looks like this. I made some small adjustments like changing the h2 to an h1 and renaming the text 'Index' to 'Suppliers'. The most obvious change is that I removed some of the columns from the table to make it less wide. When you browse for the Suppliers Index page (http://localhost:2309/Suppliers) you get the following output. It shows you all suppliers and that list can be very long. Let's add Paging so we can limit the number of suppliers in the list. In the earlier mentioned tutorial a PaginatedList<T> class was used. My solution uses a similar approach but I named it PagingList<T>. This class and some other helper classes are packed in a NuGet package named ReflectionIT.Mvc.Paging. 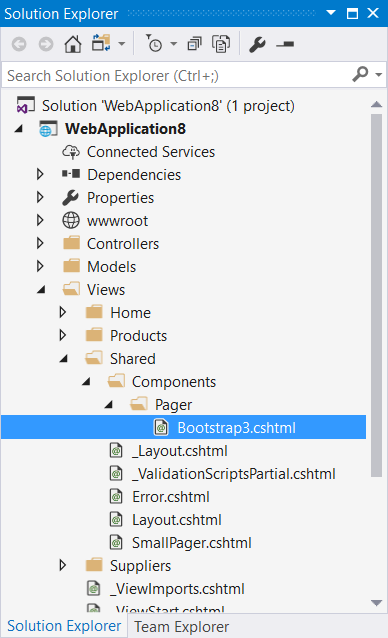 You can install the package using the NuGet browser in Visual Studio or by running the 'Install-Package ReflectionIT.Mvc.Paging' command from the Package Manager Console. After installation you can add the paging services in the ConfigureServices() method of the Startup class. Add the services.AddPaging() call as shown below. This call will register an EmbeddedFileProvider which is used for rendering the View for the Pager ViewComponent. The View will be loaded from the ReflectionIT.Mvc.Paging assembly if it can not be found in your WebApplication. Next I modified the Index() method from the SuppliersController class. I added an optional 'page' parameter with the default value 1. I defined a query in which I retrieve the Suppliers from the context (NorthwindContext) with the AsNoTracking() method and an OrderBy(). The AsNoTracking() turns off change tracking which improves the performance. The OrderBy() is required to support Paging (Skip() & Take()) in EF. This query is used to create the PagingList. The page size is set to 10. This is the model which is passed to the View. The PagingList will fetch the data from the database asynchronously. The Index.cshtml view must also be modified. I changed the model type (line 1), added a using (line 2) and an addTagHelper (line 3). Lines 2 and 3 could also be moved to the _ViewImports.cshtml file which would add these lines to every view. I also added a Pager above the table. This is done by invoking the Pager View Component and passing the Model as the pagingList. It is placed inside a <nav> element with an aria-label which is used by screen readers. I have done the same below the <table> but there I used a new feature of ASP.NET Core 1.1. The View Component is invoked as a Tag Helper. It uses the <vc /> element and the class and parameters are translated to lower kebab case. For more info read this article. This results in the following view in which you see two pagers which use bootstrap markup. For sorting I added an extra sortExpression parameter to the Index() method of the SuppliersController class. The parameter is optional and uses the CompanyName as the default sort expression in case none is supplied. The OrderBy() method is removed from the query because the PagingList will take care of the ordering. The sortExpression and the default sort expression are now required to create the PageList model. In the View I modified the header of the table. I replaced the DisplayNameFor() calls by SortableHeaderFor() calls. I pass the Model as an extra parameter. This is not required but if you do you will get nice Up and Down indicators (glyphs) in the headers when you sort ascending or descending. You can also specify the SortColumn if you want a different one as the model property. In this example I used this for the City column. There I added the CompanyName as a second column to sort on. This results in the following view in which you can sort the table by clicking the headers of the columns. An up or down indicator shows you weather you are sorting ascending or descending. To show filtering I will switch to the Products table, it has more records. The Index() method of the ProductsController has a filter parameter (besides page and sortExpression). The query is defined with an extra AsQueryable() method call. This method returns the the type IQueryable<Products>. This allowed me to append an extra Where "clause" to it when the filter is not empty. In this example I used a Contains() which translates to a like '%...%' condition. You have to set the RouteValue property of the model with all conditions used in the filter. This is used to build the correct URL in the pager and table headers. I added a form in the Index.cshtml with an input named filter and a submit button which has the method set to GET. This will execute the Index action of the controller. This results in the following view in which you can filter on ProductName and you have paging and sorting. You can customize this solutions in a few ways. You can for instance call the AddPaging method which you can use to set the PagingOptions. This allows you to specify which View is used for the Pager ViewComponent. By default a pager based on Bootstrap3 is used. But there is also already a Bootstrap4 view available. Bootstrap4 doesn't support glyphs any more so if you switch to it you also have to specify alternatives for the Up/Down indicators used in the sortable headers of the table. You can also create your own Pager view if you want to. You store it in the folder Views\Shared\Components\Pager. The easiest way to create a custom view is by coping the default Bootstrap3.cshtml from Github. You can remove the Bootstrap classes and add your own or you can generate your own html buttons. You can also render the Pager using the Html.Partial() Html Helper instead of using the Pager ViewComponent. The following snippet shows the 'SmallPager.cshtml' which I stored in the Views/Shared folder. When you store it in this folder you can access it from all views. You can download my sample app using the Download button below. I have published the code of the Pager on GitHub. It also contains a sample webapp which uses Bootstrap4. It's open source. So if you create a better pager please do a pull-request. Asp.Net Core 2.2 Paging not working How to fix? Does this work with Asp.Net Core 2.2? Paging does not seem to work. how to change index method to any other method for paging ? This is a good article, thanks! hi! it is work correct when i use inex() method from my controller! but if i can use ather method paging work incorrect-always return to index page but i need say in my acction page and paging it! How to use Custom root more page? The is helpful, but how can I change the default Action in using this example, so that redirect it to my desire page. You are an Excellent teacher. Before I try it and break my project - do you know if this works with Razor pages? Can you provide sample how to change a pager style? I didn't find a css file where can I set a custom color or size of buttons. Hi, Can I also do paging on inner collections? I want to change a column name after sorting, how is it possible? This is fantastic. Best solution I came across. Thanks! Any advice for assigning a placeholder to the sortable headers? Thanks , But i want to ask how i can keep filter and sorting during paging . This is absolutely wonderful. Thank you ! You saved me for a lot of work. good article on getting started with core and ef core. I am using View component to View List and I am getting Null in "sort Expression". Can you please help how to use paging and sorting in view component? How to sort multiple columns? Excellent! It works perfectly with model. It will be appreciated if you will suggest me how we can use with any ViewModel instead of model. Thanks! Nice, simple, elegant. You saved me a lot of work.